As we take time as a nation to give thanks, it helps to remember the source of all that we are and all that we have. This Thanksgiving Eve sermon explores this idea based on Deuteronomy 8:7-18, and Luke 17:11-19. Recorded on Wednesday, November 26, 2014 at Emmanuel Lutheran Church in Greenvine, TX. A group of scientists were excited they finally had the ultimate breakthrough. They decided to tell God they didn’t need him any more. And so God reached down and got a handful of dirt and right before their eyes he created a person. And so one of the scientists squatted down to pick up some dirt. As he handed it to another one of the scientists, God looked over his shoulder. It is often easy to take for granted what we have and what we can do when things are going well for us. We often continue to strive for yet more. And we frequently buy into the belief that we did it ourselves. Like those scientists, we may even fall into the trap of believing that we don’t even need God anymore. But God is the one who provides. Even the dirt that we turn for crops or dig out to build our houses—even that is the Lord’s doing. God is faithful to love and care for us, to provide for us. When we’re at the top of our pay scales, it is still God who gave us the ability to work in those jobs. In the times of “plenty,” it can indeed humble us to remember the times that weren’t so great. For even in the difficult times, the wilderness times of our lives, we know that God has brought us through. In the passage with Jesus healing the 10 lepers, one of them returns to thank Jesus. Now, we can’t know whether the 9 others are failing at gratitude. Could it be that this one—a foreigner even—recognizes something deeper about Jesus? Jesus tells him, “your faith has made you well.” Could it be that his faith in Jesus goes deeper than just being thankful for being made clean? Not only did Jesus heal him, but Jesus was willing to come near him even though he was unclean! And Jesus was willing to heal him even though he was a foreigner—a despised Samaritan! This Jesus who came alongside him despite his current situation, was in fact, God in-the-flesh. From one person to the next, none of our circumstances are exactly alike. Some of us may be experiencing times of plenty while others are in times of need. Some may be confident of their direction in life while others of us are wandering in some kind of wilderness. Some of us may feel well and whole while others are struggling with unspeakable ailments that keep us down. Whether it’s the time of our lives or the worst time imaginable, God is with us. God is active and present with us every day—no matter our circumstances. God made the dirt, he is present with us in our wilderness times, and he comes alongside us at our weakest and most vulnerable points. And when we become touched by the depth of his love, when we feel his presence with us despite our circumstances, it is then that gratitude is possible. And so, in this time when our nation makes a point to give thanks, it is my fervent prayer for you that you may see all of life as a gift from God. And may you recognize him as your source, your strength, and an abiding presence with you no matter what. 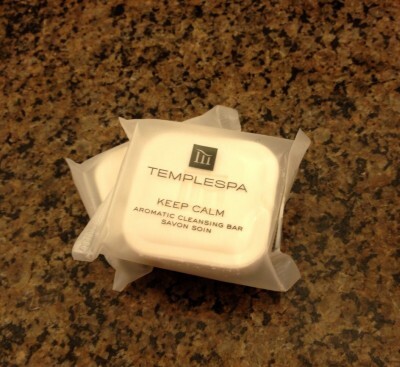 I used to hoard hotel amenities like the little bars of soap and the small bottles of shampoo. But I don’t anymore and I want to tell you about my transformation in this area. It started innocently enough. When I would go to a hotel for a youth event or band trip in high school I would grab the shampoo & conditioner bottles from the bathroom before checking out. As a young-married I would grab the shower-cap to take home with me if I didn’t use it during our stay. But those little bottles are so darling, and I found that on multiple-night stays that hotel staff would replenish any and all amenities that appeared to be used up. So, to create the appearance of them being used up, I would stash whatever was left in the morning in my suitcase before they came to refresh the room. Sure enough, they replaced everything. I found that I could do this each and every morning and build up quite a little store of soaps, shampoos and shower caps. At some point in married life there came a trend of getting in-room coffee and tea at some hotels. And I found I could do the same trick of stashing the pillow-packs of coffee, the tea bags, and sugar in my suitcase and those too would get replenished each day! In a similar way to how I stopped collecting magazines, I finally stopped hoarding these little hotel goodies. For one thing, it became a storage problem for me. I mean, I wasn’t going to use those little bottles and bars at home and I didn’t travel frequently enough to use them all. I hardly ever used the coffee pillow packs, and I didn’t really much like the tea bags compared to the brand I always favor at home. So, here was all this loot that kept taking up space in my life and in my home. But that wasn’t really what did it. I mean, I found places to stick all the little treasures here and there. And then they were out of sight, out of mind. What really did it for me was moving around the country multiple times. Having so much stuff that needs packed and unpacked prompted me to take an honest look at just how much I was hoarding. Because really, when all I wanted was to find my son’s bath toys, I didn’t expect to have so many “Bathroom” boxes to go through. And when I wanted bath toys and only found mixed lots of hotel shampoos, no one was served by that. So, I started to get honest with myself about my hoarding habit and decided to cease the stock-piling. So, here I am at this church convention this weekend and would you believe they have the most scrumptious-smelling little bars of soap at the hotel where we’re staying. I mean, absolutely divine. And all I want to do is take ALL the bars home. And there’s a Keurig coffee-maker in the room. I don’t even have a Keurig at home, but I want to take ALL the little K-cups home with me. What is with this crazy compulsion? I have to consciously talk myself out of grabbing everything each day. It reminds me of the story in the Bible (Exodus 16) when God provided manna for the Israelites in the wilderness. God instructed them to just gather up what they needed for each day and no more. And when they gathered up too much, it was spoiled by morning anyway. But there was always plenty to gather each new day. Whether it’s me and soap or it was the Israelites and manna, trying to store more than needed only backfires and leaves us with something unpleasant to have to manage. Pluswhich, the hoarding in both cases is/was wholly unnecessary! I’ve never gone a whole day without access to soap or coffee. Even now, back at my house, there are back-ups of full-sized bars of soap in a cupboard in the bathroom; there is coffee in the pantry. To be honest, I’ve never gone a whole day without all of my real physical needs being filled. God’s provision is abundant, but still I find myself wanting to grab more than I need. Once again, I talk myself out of taking ALL the amenities. Before I leave, I’ll lather my hands up and inhale the wonderful aroma of the soap one last time, and I’ll have one last cup of coffee brewed in the Keurig. Then I’ll head back home and enjoy the “amenities” there. And I will be fine without hoards of things I don’t really need. Better than fine. I will be free.